harveyorgan.wordpress.com and at the silverdoctors website on a continual basis. A few months ago the comex had 303 tonnes of total gold. Today the total inventory rests at 261.94 tonnes for a loss of 41 tonnes. In silver, the open interest continues to remain extremely high and today we are at multi year highs at 179,608 contracts. To boot, the December silver OI remains extremely high at 123,353. Today, we had no change in gold Inventory at the GLD/ inventory rests tonight at 741.20 tonnes. SLV’s inventory remains unchanged and rests at 343.415 million oz. First: GOFO rates/We are now in backwardation!! All months basically moved slightly in a positive directions with the first one month GOFO still in the negative. On the 22nd of September the LBMA stated that they will not publish GOFO rates. However today we still received today’s GOFO rates. It looks to me like these rates are now fully manipulated. The total gold comex open interest fell by a narrow margin of 1196 contracts from 419,455 down to 418,259 with gold down $26.90 yesterday. Not too many longs left the arena despite the huge whack in gold yesterday. The October contract month is now off the board. The next delivery month is November and here the OI actually fell by 207 contracts. The big December contract month saw it’s Oi fall by 2-56 contracts down to 273,348. The estimated volume today was very good at 297,270 with the help from Bart’s high frequency boys. The confirmed volume yesterday was also good at 226,686. Strangely on first day notice, we had only 2 notices filed for 200 oz. The fun begins with the silver comex results. The total OI rises to a new multi year record of 179,608 a rise of 3,164 contracts from yesterday with silver down a whopping 83 cents.In ounces, this represents a total of 898 million oz or 128% of annual global supply. The next non active silver contract month is November and here the OI fell by 355 contracts down to 164. The big December active contract month saw it’s OI surprisingly rise by 4588 contracts up to 123,353. In ounces this is represented by 616 million oz or 88.1% of annual global production (production = 700 million oz – China). The estimated volume today was humongous at 80,317. The confirmed volume yesterday was also huge at 93,369. We also had 44 notices filed on first day notice for 220,000 oz. Data for the November delivery month. i) out of HSBC: 904.043oz was removed from the dealer and this landed into the customer account at HSBC. Several weeks ago we had total gold inventory of 303 tonnes, so during this short time period 41 tonnes have been net transferred out. We will be watching this closely! Today, 0 notices was issued from JPMorgan dealer account and 0 notices were issued from their client or customer account. The total of all issuance by all participants equates to 2 contracts of which 0 notices were stopped (received) by JPMorgan dealer and 0 notices were stopped by JPMorgan customer account. To calculate the total number of gold ounces standing for the November contract month, we take the total number of notices filed for today (2) x 100 oz to which we add the difference between the OI for the front month of November (67) – the number of gold notices filed today (2) x 100 oz = the amount of gold oz standing for the November contract month. Total of all silver inventory (dealer and customer) 180.805 million oz. the total OI for the front month of November(164) minus (the number of notices filed today (44) x 5,000 oz = the total number of silver oz standing so far in November. It looks like China is still in a holding pattern ready to pounce when needed. Oct 27.2014: no change in gold inventory at the GLD/inventory 745.39 tonnes. Oct 24.2014: a huge withdrawal of 4.48 tonnes of gold at the GLD/Inventory 745.39 tonnes. This gold is heading to friendly territory: namely Shanghai. Oct 23.2014: no change in gold inventory at the GLD/Inventory at 749.87 tonnes. Oct 22.2014: we lost another 2.1 tonnes of gold at the GLD. Inventory rests at 749.87 tonnes. This tonnage no doubt is off to Shanghai. Oct 21.2014: no change in inventory/GLD inventory rests tonight at 751.96 tonnes. Note: Sprott silver trust back hugely into positive territory at 4.68%. Those large specs that have been long in gold pitched a huge 11,244 contracts from their long side and they were rewarded. Those small specs that have been short in gold covered 2542 contracts from their short side. Commercials go net long and then they raid!! Those small specs that have been short in silver added a tiny 52 contracts to their short side. It has been a busy week for the man once known as “Maestro”. The end of last week saw him engage in public discussions with the likes of Marc Faber and Peter Schiff at the New Orleans Investment Conference. 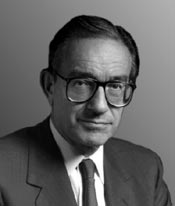 Greenspan, who headed the Federal Reserve from 1987 to 2006 surprised guests in New Orleans when he stated bluntly, “I never said the central bank was Independent!” in response to criticism that the Fed was financing social programmes. So, the primary policy the Fed has – which is to put a floor under favoured markets and support U.S. bond and asset prices and give the process a complicated sounding title – has failed, according to the ‘Maestro’ who devised said policy. What happens next? We don’t know but for once we would be inclined to follow Mr. Greenspan’s advice. If the mooted end of QE is bearish for gold and silver, then it is also equally bearish if not more so for overvalued stock and bond markets. Yet, those markets saw far less volatile trading and saw minor losses – the S&P closed down just 0.14%. Silver still in backwardation in Shanghai and the price of silver still has a premium of 4%. if any metal there exists. Bloomberg came out on October 28 with an article about Chinese silver hitting a premium of 17 % this month. Have a look at Bloomberg’s chart on Chinese silver premiums. Regular readers know I’m one of the few that reports on the pure price of silver in China being cheaper than in London, because all Chinese commodity exchanges quote silver including 17 % VAT. If we subtract 17 % from the quoted prices, the pure price of silver in China is currently trading at a 4 % discount to London, not at a premium like Bloomberg states. As we can see in my chart below the premium is negative. By the way, silver is still trading in backwardation on the Shanghai Futures Exchange (SHFE), since August 6. This has caused the discount to decline to 4 %. silver transactions are subject to 17% VAT in China. In other words, local smelters need to pay 17% tax on silver contained in imported concentrates (typically based on international prices). However, as domestic prices (excluding tax) have been trading consistently lower than the international price, it is not surprising that local smelters tend to prefer low silver content in imported concentrates. It is worth stressing here that silver prices quoted on commodity exchanges in China have already included a 17% VAT. Silver in China has been the most expensive relative to London in about three years as exporters stepped up overseas shipments to qualify for a tax rebate, draining inventories of the metal. …exporters boosting shipments by classifying ingot as acoustic wire, said Liu Xu, a precious-metals analyst at Capital Futures Co. in Beijing. What’s wrong with this story? Why would any foreigner import silver ingots from China when it’s 14 % more expensive than in London? Doesn’t make sense right? This is my view: it could very well be silver ingots are exported as acoustic wire from China because the pure price of silver in China is cheaper than in London (not more expensive as Bloomberg states). However, to arbitrage the price difference, foreign importers would need to be able to pay the pure price of Chinese silver, excluding VAT. It can go like this. The exporter buys silver ingots, for example, on the SHFE and is required to pay the pure price plus 17 % VAT. When he would export this as ingots there is no VAT rebate for him from the government, this law was passed in 2008, so he would have to charge his trading partner the price of silver plus 17 % VAT to balance the VAT he paid at the SHFE. If the foreign importer is charged with VAT from another country he can’t get restitution, he would pay for the pure price of silver imported plus 17 %. The Chinese government implemented the aforementioned law to withhold silver ingots/bullion from leaving the country. Of course silver is exported in many other forms, like in solar panels or acoustic wire. The next quote is from the law passed in 2008 that ended VAT rebates on silver ingot export. Department of Treasury, State Dept of Taxation Notice on Adjustment on Export Rebates of Textiles and other Commodities. 1. Some textile, garment export rebate is raised from 11% to 13%; Export rebate for certain bamboo products is raised to 11%. For exact details please see Appendix 1. Export rebates for these products are cancelled: Pine kernels, certain agricultural chemicals, certain organic arsine chemicals, taxol and its products, rosin, silver, No. 0 zinc, certain paint products, certain battery products, carbon anode. For exact information please see Appendix 2. The aforementioned export rebate changes take place on Aug 1, 2008. Applicability is determined by the date specified on the form “Export of Goods Customs Declaration (for Export Rebates)”. Outbound shipments of silver this year have at times been classified as acoustic wire as traders sought a 17 percent export rebate used to encourage domestic high-end manufacturing, Liu Xu, an analyst at Capital Futures Co., said Oct. 29. There you have it, silver ingots don’t get a rebate when exported, acoustic wire does get a rebate. This is how the exporter can sell silver abroad for China’s cheaper pure price. So, the exporter found a way to arbitrage the price difference between Shanghai and London. If the difference is 4 %, both the exporter and the importer can have a piece of the pie. This scheme could perfectly cause high demand for silver in Shanghai and the concurrent backwardation on the SHFE. Bloomberg’s analysis, stating silver is trading at a premium in China, I think is incorrect – wouldn’t be the first time. Exporting silver ingots as acoustic wire is another example of fraud and circumventing protectionism. Let’s hope governments will realize some day that capitalism can only thrive in free markets. 1) That for the time being central banks and the governments they control remain in charge of the gold price and most prices through the rigging mechanisms of gold reserve leasing and swapping and the futures markets, where they are able to deploy infinite money in secret. 2) That as the world’s economy continues to weaken, with wealth being transferred from the masses to the elites, central banks and the governments they control will resort to still more totalitarian methods to maintain their control. — should be directed to central banks and the governments they control as well as to financial news organizations, though of course financial news organizations, especially in the West, remain unlikely ever to commit actual journalism in regard to gold particularly and central bank interventions generally. — so that the council might seem busy while central banks wage uncontested war against the monetary metal. 5) That most gold and silver mining industry executives will continue to have no idea about the monetary nature of their product and the surreptitious mechanisms of its pricing and will remain silent and incurious even as the prices of their products sink well below the cost of production and the share prices of their companies fall to zero. 6) That, nevertheless, GATA will press on in pursuit of a constituency for free and transparent markets, limited and accountable government, and fair dealing among nations and peoples. 7) And that someday, some year, some decade, some century we shall know the truth and if it doesn’t make us free it at least will give us a clue about becoming so. A huge commentary from Alasdair Macleod..
Alasdair tackles the time from 1983 to 2002 on China’s gold strategy. He strongly believes that China bought 20,000 tonnes from that time period and probably another 5-10,000 tonnes from 2002 until now. He is probably correct when he says that they had accumulated so much gold that they then allowed its private citizens to hoard as they already amassed a hoard untouched by the west. If so this is a game changer!! China first delegated the management of gold policy to the People’s Bank by regulations in 1983. This development was central to China’s emergence as a free-market economy following the post-Mao reforms in 1979/82. At that time the west was doing its best to suppress gold to enhance confidence in paper currencies, releasing large quantities of bullion for others to buy. This is why the timing is important: it was an opportunity for China, a one-billion population country in the throes of rapid economic modernisation, to diversify growing trade surpluses from the dollar. To my knowledge this subject has not been properly addressed by any private-sector analysts, which might explain why it is commonly thought that China’s gold policy is a more recent development, and why even industry specialists show so little understanding of the true position. But in the thirty-one years since China’s gold regulations were enacted, global mine production has increased above-ground stocks from an estimated 92,000 tonnes to 163,000 tonnes today, or 71,000 tonnes* ; and while the west was also reducing its stocks in a prolonged bear market all that gold was hoarded somewhere. China’s 1983 gold regulations coincided with the start of a western bear market in gold, when Swiss private bankers managing the largest western depositories reduced their clients’ holdings over the following fifteen years ultimately to very low levels. In the mid-eighties the London bullion market developed to enable future mine and scrap supplies to be secured and sold for immediate delivery. The bullion delivered was leased or swapped from central banks to be replaced at later dates. A respected American analyst, Frank Veneroso, in a 2002 speech in Lima estimated total central bank leases and swaps to be between 10,000 and 16,000 tonnes at that time. This amount has to be subtracted from official reserves and added to the enormous increase in mine supply, along with western portfolio liquidation. No one actually knows how much gold was supplied through the markets, but this must not stop us making reasonable estimates. Between 1983 and 2002, mine production, scrap supplies, portfolio sales and central bank leasing absorbed by new Asian and Middle Eastern buyers probably exceeded 75,000 tonnes. It is easy to be blasé about such large amounts, but at today’s prices this is the equivalent of $3 trillion. 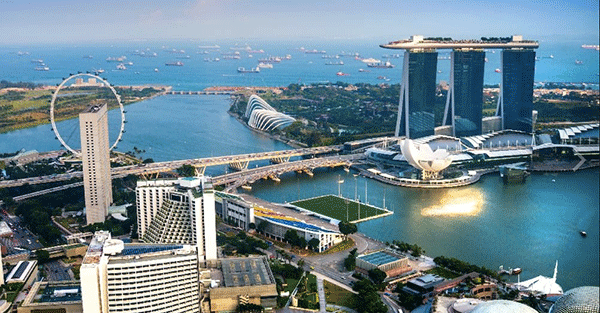 The Arabs had surplus dollars and Asia was rapidly industrialising. Both camps were not much influenced by western central bank propaganda aimed at side-lining gold in the new era of floating exchange rates, though Arab enthusiasm will have been diminished somewhat by the severe bear market as the 1980s progressed. The table below summarises the likely distribution of this gold. Today, many believe that India is the largest private sector market, but in the 12 years following the repeal of the Gold Control Act in 1990, an estimated 5,426 tonnes only were imported (Source: Indian Gold Book 2002), and between 1983 and 1990 perhaps a further 1,500 tonnes were smuggled into India, giving total Indian purchases of about 7,000 tonnes between 1983 and 2002. That leaves the rest of Asia including the Middle East, China, Turkey and South-East Asia. Of the latter two, Turkey probably took in about 4,000 tonnes, and we can pencil in 5,000 tonnes for South-East Asia, bearing in mind the tiger economies’ boom-and-bust in the 1990s. This leaves approximately 55,000 tonnes split between the Middle East and China, assuming 4,850 tonnes satisfied other unclassified demand. The Middle East began to accumulate gold in the mid-1970s, storing much of it in the vaults of the Swiss private banks. Income from oil continued to rise, so despite the severe bear market in gold from 1980 onwards, Middle-Eastern investors continued to buy. In the 1990s, a new generation of Swiss portfolio managers less committed to gold was advising clients, including those in the Middle East, to sell. At the same time, discouraged by gold’s bear market, a western-educated generation of Arabs started to diversify into equities, infrastructure spending and other investment media. 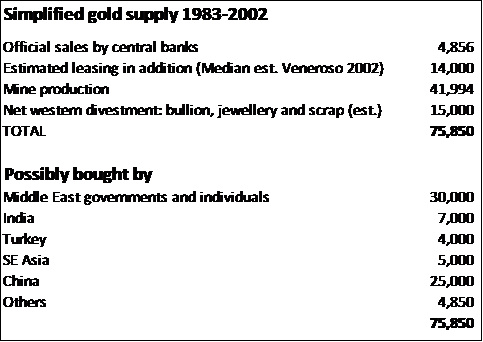 Gold stocks owned by Arab investors remain a well-kept secret to this day, but probably still represents the largest quantity of vaulted gold, given the scale of petro-dollar surpluses in the 1980s. However, because of the change in the Arabs’ financial culture, from the 1990s onwards the pace of their acquisition waned. We now know that China had the resources from its trade surpluses as well as the opportunity to buy bullion. Heap-leaching techniques boosted mine output and western investors sold down their bullion, so there was ample supply available; but what was China’s motive? Initially China probably sought to diversify from US dollars, which was the only trade currency it received in the days before the euro. Furthermore, it would have seemed nonsensical to export goods in return for someone else’s paper specifically inflated to pay them, which is how it must have appeared to China at the time. It became obvious from European and American attitudes to China’s emergence as an economic power that these export markets could not be wholly relied upon in the long term. So following Russia’s recovery from its 1998 financial crisis, China set about developing an Asian trading bloc in partnership with Russia as an eventual replacement for western export markets, and in 2001 the Shanghai Cooperation Organisation was born. In the following year, her gold policy also changed radically, when Chinese citizens were allowed for the first time to buy gold and the Shanghai Gold Exchange was set up to satisfy anticipated demand. All other members of the Shanghai Cooperation Organisation** are gold-friendly or have increased their gold reserves. So the west having ditched gold for its own paper will now find that gold has a new role as Asia’s ultimate money for over 3 billion people, or over 4 billion if you include the South-East Asian and Pacific Rim countries for which the SCO will be the dominant trading partner. U.S. stock index futures rallied on Friday alongside most markets globally after the Bank of Japan significantly ramped up its stimulus program just days after the U.S. Federal Reserve wound down its own package of economic incentives. If futures’ gains hold after the open, the S&P 500 will test its record high set more than a month ago. The BOJ’s board voted 5-4 to accelerate purchases of Japanese government bonds while tripling its purchases of exchange-traded funds and real-estate investment trusts. Following the confirmation of the end of the US Fed’s QE programme, gold and silver prices have come crashing down. 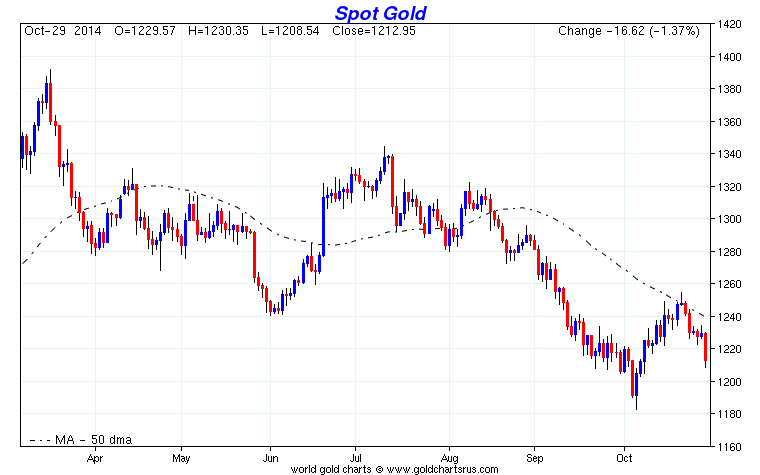 Gold and silver prices have been on a sharp downwards path since the US Fed went ahead and announced the end of QE – helped by some big sales on the futures (paper gold) markets. Kick the gold bugs while they are down seems to be the mantra of the day. Given the end to US QE had been telegraphed months in advance, the latest precious metals price move could have been seen as somewhat surprising – but the big money knows when to strike to its maximum advantage. Gold this morning had been driven back to the $1 170 an ounce level and silver below $16 – the lowest since early 2010. Both were showing a small pick-up at the time of writing. But there are some factors which suggest the latest gold and silver price takedown may have been overdone. While QE in the US may be ending, that in Europe may be taking off again. Even in the US the Fed seems wary about allowing interest rates to increase and in Europe they are at rock bottom. But the big anomaly in the gold and silver price decline is again Asian demand. Contrary to many reports Chinese demand, as reported by the Shanghai Gold Exchange (SGE), appears to be taking off again in a big way. Nick Laird of Sharelynx reports that the latest weekly withdrawals figure from the SGE hit 59.7 tonnes, which makes total Chinese gold demand – so far this year – over 1 600 tonnes. And if the big weekly withdrawal figures continue for the rest of the year, Chinese demand is again on the way to the 2 000 tonne mark. While SGE withdrawal levels are still well below those of 2013, as the chart below shows, they are getting back there after a hiatus period mid-year. The chart shows full-month withdrawals to September, and October is heading perhaps to the 220-230 tonne mark (close to record high levels), despite the SGE being closed for a week at the beginning of the month for the Golden Week holiday. Gold price and demand just doesn’t gel – but then it should be remembered that in 2013 Chinese demand was enormous, yet the gold price fell consistently throughout the year. This all appears to be a great example of futures trading distorting the markets to the advantage of those with the big money which can play them. See: Futures markets keep precious metals prices depressed. When we wrote this article it was primarily referring to futures trading on the American exchanges but we have since been reminded that the bulk of the trade in gold futures is on the London markets. On a straight supply/demand basis current Chinese weekly demand is really close to total weekly global new mined supply. Add in Indian demand, which is at a sufficient level to worry the country’s government again with respect to its current account deficit given imported gold’s huge impact. This is also running at very high levels – perhaps at least 50% of that being seen in China. It is a little more difficult to get a handle on the Indian levels given the impact of smuggling due to the 10% import tax, but between them at the moment Chinese and Indian demand together look to be hugely in excess of global mined supply. And that is all, of course, without taking into account gold demand from the rest of the world. So we have a huge anomaly developing again between gold supply and demand, together having some analysts wonder where on earth all this supply is coming from. The logical answer is perhaps leased gold from central banks, but as most of this appears to be disappearing into firm hands in the East which will not readily come back on the market, the big question is how can this leased gold ever be returned? The short answer is that it cannot. But, we are living in a world which has spawned a global financial system built on unrepayable debt and money printing out of thin air – yet life goes on regardless. Will the whole system ever come crashing down…? Logic and history suggests it will – eventually. But eventually could be an awful long way ahead as long as the politicians can keep on convincing the general public that the system works. The old adage that you can fool some of the people all of the time, and all of the people some of the time is well in play – but is it becoming you can fool all of the people all of the time in this day and age? 3. Europe stocks up/Euro down USA dollar index up at 86.54.
as the great Yen massacre!!! 3e Japanese companies going bankrupt with the high yen vs dollar at over 111. 3i Japan to buy 100% of all new Japanese debt and by 2018 they will have 25% of all Japanese debt. 4. USA 10 yr treasury bond at 2.33% early this morning. Because as previously reported, the reason why this morning futures are about to surpass record highs is because while the rest of the world was sleeping, the BOJ stunned those few who were looking at Bloomberg screens with a decision to boost QE, announcing it would monetize JPY80 trillion in JGBs, up from the JPY60-70 trillion currently and expand the universe of eligible for monetization securities. A decision which will forever be known in FX folklore asthe great Halloween Yen massacre. Some more details on what the latest massive central bank intervention did to what only laughably can one now call “markets” via BBG: European shares rise with the bank and financial services sectors outperforming and media, retail underperforming. Asian stocks rise led by Nikkei as Bank of Japan’s Kuroda raises stimulus to another record. Euro-area inflation data matched forecasts. Companies including RBS, WPP, IAG, Banco Popular, BNP, AB-InBev released results. German Xetra trading halted by computer malfunction. The French and Italian markets are the best-performing larger bourses, Swedish the worst. The euro is weaker against the dollar. French 10yr bond yields fall; Irish yields decline. Commodities decline, with silver, gold underperforming and natural gas outperforming. The BoJ takes centre stage overnight after unexpectedly increasing their QQE programme by JPY 10trl, sending the Nikkei 225 surging higher by 4.8% to its highest level since 2007, the e-mini S&P through 2,000, USD/JPY above 111.00 to its highest level since Jan’08 and spot gold to its lowest level since 2010. ECB’s Nowotny lifts Bunds after deviating from his usual hawkish script by adopting a never say never approach to an ECB QE programme. Looking ahead, attention turns towards US personal income & spending, Chicago PMI and Univ. of Michigan confidence. Treasuries extend second week of losses after Fed ends QE as Bank of Japan expands what was already an unprecedentedly large monetary-stimulus program, boosting stocks and sending the yen tumbling. JGBs trade up 6 ticks at 146.68, after paring their earlier sharp gains as Japan’s GPIF panel approved cutting JGB allocation to 35%, according to sources. Prices touched a fresh record high after the BoJ unexpectedly increased its JGB purchases by JPY 30trl per year. The Nikkei 225 closed up 4.8%, at its highest level since 2007, after the BoJ unexpectedly increased their QQE program. Furthermore, the index was also supported by reports that Japan’s GPIF panel approved raising domestic stock holding to 25%, according to government sources. The Hang Seng closed up 1.3% after opening at its best levels since Sep. 25, while the Shanghai Comp closed up 1.2%, both indices bolstered by several upbeat corporate earnings. The aforementioned action taken by the GPIF very much set the tone for the European open, with cash futures opening firmly in the green (Eurostoxx 50 currently +1.7%). On a sector specific basis, financial names lead the way for Europe following strong earnings reports from RBS (+3.4%) and BNP (+3.9%). However, gains for the sector have been capped following further downward momentum for Italian banks after Moody’s have initiated a review for a potential downgrade on various peripheral banks. Despite opening lower, the downside for Bunds was short-lived following some comments from ECB’s Nowotny who went against the grain of his usual hawkish rhetoric, more specifically, the central banker said never say never to QE in Eurozone, while refusing to rule out expanding the purchasing programme to include more corporate bonds. This saw a gradual turnaround in Bunds as they broke above 151.00, with further positive sentiment provided by, a weak German retail sales report and the fact that the GPIF have increased ratio of foreign bonds to 15% vs. Prev.11%. The main focus for FX markets today has been the broad-based USD strength which has dominated a bulk of the price action in FX markets and pushed JPY lower against its major counterparts with USD/JPY breaking above 111.00 to reach its highest level since Jan’08. Elsewhere, NZD saw some strength overnight after Fonterra announced that China has lifted its temporary suspension on base powder exports which has been in place since August 2013. Despite initially, being out-muscled by the greenback, the RUB clawed back some ground after the Russian central bank unexpectedly hiked rates by 150bps, with the market looking for just a 50bps cut. However, the move lower in USD/RUB was capped by the bank not abolishing rule-based interventions. Movements in the USD-index have dictated the state of play for the commodity complex, with spot gold falling to its lowest level since 2010, while both WTI and Brent crude futures reside in the red. For base metals, copper is poised for its first monthly advance since July ahead of tomorrow’s Chinese official PMI release with the red metal benefitting from improved Asian investor appetite. More specifically for energy prices, Brent crude is heading for a sixth consecutive loss which would be the longest decline since 2002 as global supplies and the stronger USD continue to weigh on investor sentiment. and what do u expect to happen to JGBs when Stocks rip 1000 points… yep they’re rallying! Yield on 10-yr govt bond declines 3.5 bps to 0.435%, while 20-yr yield also slides 3.5bps to 1.285%, both lowest since April 2013. Nikkei 225 is up 700 points from this afternoon’s 2-week old headline and broken markets!! Even though Kuroda said Japan could control hyperinflation through monetray policy.. The following commentary was written just prior to the announcement of huge stimulus coming from Japan. Due to the depreciation of the JPY, leading to soaring raw material costs (crushing SME profitability), TSR reportsthat Japanese bankruptcies year-to-date in 2014 are up a stunning 140% having unerringly surged since Abenomics was unleashed. Despite constant reassurance and propaganda from various political leaders each and every night that Japan is on the right track… it simply is not and if there is a better indicator of the death spiral Abe has unleashed than surging bankruptcies, we are unaware of one. By industry, 81 of the transportation industry such as automobile cargo transportation industry (composition ratio 37.9%) is at most, fuel prices remain high is affected. Next, review the manufacturing industry 44 (20.6%), Wholesale 41 (19.2%), service industries other 19 cases (8.9%), and has spread retailing 11 (up 5.1%) in a wide range of industries. Depreciation of the yen impact leads to soaring raw materials, profit deterioration deplete the strength of small and medium-sized enterprises. In addition to the deterioration in earnings, depending on trends of the future of the exchange rate, are also concerned about such further sales slump due to price competition. A survey released last month by the Osaka Chamber of Commerce and Industry showed the majority of respondents viewed an exchange rate of 95-105 yen per dollar to be ideal. Japan Chamber of Commerce and Industry Chairman Akio Mimura said this month a “pleasing” level for the yen would be 100 per dollar, Kyodo reported. An increasingly weaker yen won’t necessarily benefit Japan’s large exporters. Nintendo Co. booked a 15.5 billion-yen ($142 million) gain in the fiscal first half from the lower currency. The median forecast among analysts surveyed by Bloomberg News is for the currency to weaken to 114 per dollar by the end of 2015 as U.S. and Japanese monetary policies diverge. It hasn’t been that weak since 2007. Prime Minister Shinzo Abe said on Oct. 7 that yen depreciation is hurting small companies and households, almost two years after triggering the currency’s slide with a call for unlimited monetary easing to end deflation. Little more than a week later, Kuroda said a weak yen can depress the non-manufacturing sector and real incomes, before reiterating on Oct. 28 that declines in the currency have been positive overall for Japan’s economy. Confidence among small businesses unexpectedly fell this month, according to a survey of 1,000 companies by Shoko Chukin Bank released Oct. 28. The measure languished for a seventh month below the line that signals a balance between optimists and pessimists. And so – if you are betting on NKY strength… reliant on JPY weakness… think again. Abe and Kuroda are boxed in. Last night, we had an agreement between Russia and Ukraine on supplying gas to Europe. Ukraine and Russia reached an interim natural-gas supply deal in talks brokered by the European Union to secure flows before the heating season, a Russian Energy Ministry spokeswoman said. The accord agreed by Russian Energy Minister Alexander Novak, his Ukrainian counterpart, Yuri Prodan, and EU Energy Commissioner Guenther Oettinger will enable resumption of deliveries of gas from Russia to Ukraine after they were halted in June in a pricing and debt conflict. Russian Energy Ministry spokeswoman Olga Golant, speaking by phone, confirmed the agreement. The 28-nation EU was seeking to avoid a repeat of 2006 and 2009, when disputes between the former Soviet republics over gas debts and prices led to fuel transit disruptions and shortages across Europe amid freezing temperatures. Moscow and Kiev have clinched a deal that will guarantee that Russian gas exports flows into Ukraine throughout the winter despite their intense rivalry over the fighting in eastern Ukraine. In Thursday’s signing ceremony following protracted negotiations, the two sides promised to get the gas flowing into Ukraine again after a long and bitter dispute over payments. EU Commission President Jose Manuel Barroso announced the “very important agreement” between the two sides. Talks to guarantee that Russian gas imports flow into Ukraine throughout the winter appeared to be at an impasse Thursday because of doubts over payments from Kiev. A European Union official says the negotiations, which were supposed to produce an agreement Wednesday, broke up inconclusively early Thursday, with a draft for a ‘common understanding’ sent to Moscow and Kiev for consideration. The official asked not to be named because an agreement had yet to be reached. Please pay attention to the following. Putin is announcing to the west that there is going to be a new world order. Study the 10 points carefully!! 3. The builders of the New World Order have failed, having built a sand castle.Whether or not a new world order of any sort is to be built is not just Russia’s decision, but it is a decision that will not be made without Russia. This did not last long. After rising 5% yesterday, the Russian rouble crashes the most in 6 years even though the interest rate was raised today. Putin is not a happy camper! Yesterday’s record-breaking surge in the Rubleappears, as we warned, to have been front-running today’s rate-hike announcement… and despite its surprise size, it is disappointing the market. The 5%-plus swing higher in the Ruble yesterday has been notably retraced as the Russian currency plunges (biggest drop in almost 6 years) after the central bank hiked rates 150bps(expectations were broadly of a 50bps hike) but it appears the ‘whisper’ number was a 200bps hike and a shift in FX policy to more active intervention. The inituial rip rally instantly faded and despite low liquidity due to Russian holidays, USDRUB is back over 43 – which would be a new record low close if it holds. Closing Portuguese 10 year bond yield: 3.21% down 13 basis point from this morning. Closing Japanese 10 year bond yield: .46%down 1 in basis points from this morning. 111.91 yen to the dollar. The pound is marginally up from Wednesday as it now trades just above the 1.60 level to 1.6003. The Canadian dollar is up trading at 1.1191 to the dollar. 2/ Asian bourses all in the green / Chinese bourses: Hang Sang in the green, Shanghai in the green, Australia in the gr: red/Nikkei (Japan) green/India’s Sensex in the green/Australia in the green/India in the green/Japanese Nikkei in the green. Your closing Spanish 10 year government bond Friday/ down 7 in basis points in yield from Wednesday night. Spanish 10 year bond yield: 2.09% !!!!!! session but was down on the day breaking the 160 barrier at 1.5994. The Canadian dollar was down a lot in the afternoon and was down on the day at 1.1271 to the dollar. Your closing USA dollar index: 86.73 up 73 cents on the day!!!! The big story last week as the world shuns the dollar! The Ebola circus continues, and the Obama Administration officials look like clowns. Let’s just take a look at a few of the headlines. “Health System Not Prepared for Ebola” is a headline from the AP, and that is in stark contrast to what we have been told. “Small clusters could overwhelm the system” is what the article says. So, this begs the question of why no quarantine? Some governors in places like New Jersey, New York and Illinois think quarantine is the way to go. It is scientific technique on how to contain infectious disease, but that is not what the Obama Administration thinks. Some in the MSM think the same thing. This opinion piece says the decision by these governors is “hasty” and“adds to the Ebola problem.” Really? Well, that is not what the Pentagon thinks because it is“isolating troops back from Africa for 21 days.” Some of the talking points are downright bogus. They say things like we should treat these returning health care workers like “conquering heroes.” Who is going to think these folks are “heroes” if they come back and infect people? Africa’s best chance of beating this is if America stays strong and uninfected. If America is consumed by Ebola, or even the fear of Ebola, West Africa hasn’t got a chance. The Federal Reserve supposedly ended its QE program this week. That is where they printed money to buy bonds to hold interest rates down. So, what’s going to hold interest rates down now? Are they just going to put all this Federal debt out for bids and let the market set the interest rates? Can the Federal government, home buyers, car buyers, credit card holders and the overall economy afford higher rates? You’ve got to be kidding. Gregory Mannarino of TradersChoice.netsays the Fed can’t just say it wants low interest rates. It has to do something to keep them low. Mannarino thinks the Fed is now going to force the big banks that got all this QE to buy Treasury and other government debt. Mannarino told me that he thinks the Fed is going to continue to print money to finance another form of QE. He says the money printing has not ended and will never end. The Fed is just going to call it something else. The Fed also says the economy and employment have improved, and the third quarter had a 3.5% growth rate. John Williams of ShadowStats.com says the 3.5% growth rate is “Happy election eve numbers” and says it was boosted by “guessed at trade numbers and defense spending.” Williams says look for a downside revision. If the economy was really that good, would we have nearly 93 million people notin the workforce? There are 46 million people on food stamps, and half of Americans make less than $28,000 a year. Would mortgage applications be hitting 19 year lows? Would former Fed Head Alan Greenspan be warning about “turmoil” in the economy because of ending QE? Oh, and “Maestro” Greenspan is also telling people to buy gold? Let that sink in, Greenspan is telling people to buy gold!! Violence appears to be flaring up in Israel again. An Israeli was shot at the famous Temple Mount religious site, also known as the al-Aqsa Mosque. The site was closed down after the shooting of an Israeli right-wing activist. Now, Palestinian Authority President Mahmoud Abbas is calling for a“day of rage.” Violence is expected. Finally, I just received notification that my health care provider is going to raise my premium again for next year by about a $100 bucks a month. My health care has gone up by about 60% since Obama Care was signed into law. Blue Cross and Blue Shield of North Carolina says that it’s going up because not enough young people have signed up. I have no problem with Blue Cross and Blue Shield. Health care costs money, especially with a bad law. Health care was supposed to be cheaper because of Obama Care, but for most people—it’s not. Multiply those increases by millions of policyholders and you can imagine what is going to happen to the economy. What really gripes me is the Democrats lied as a party to get this economy killing plan passed.